A few days ago Sarah Palin reminded us that she originally rose to political prominence in Alaska by taking on the self-proclaimed “Corrupt Bastards Club” of establishment Republican politicians who had literally sold the state government to the oil industry. After giving an excellent analysis of where the whole ObamaCare disaster is heading – single payer socialized medicine – Palin said what was on the minds of millions of limited government constitutional conservatives after the GOP establishment waived the white flag. And the one establishment Republican politician who arguably came out better than anyone else in the deal to end the stand-off over defunding ObamaCare and imposing real spending reform on the federal government was the Senate’s Republican Minority Leader, Senator Mitch McConnell of Kentucky. Our friend Michael Patrick Leahy over at Breitbart reports that it turns out the bill to end the government shutdown that was passed by Congress and promptly signed by President Obama included only one earmark for a major public works project--an additional $2.1 billion authorization for the Olmsted Dam Project in McConnell's home state of Kentucky. This pet project of McConnell’s is already 300% over budget. The project was first authorized by Congress in 1988 in Section 3 (a) (6) of Public Law 100-676, the Water Resources Development Act of 1988 at an original price tag of only $775 million. Two and a half decades later, the federal government has spent just short of $1.7 billion on the project to date, which remains less than half way complete. No wonder nearly half (47%) of those surveyed in a USA TODAY/Princeton Survey Research Poll said Congress would work better if most members were replaced. The Senate conservatives Fund and The Madison Project, two major national conservative organizations have now joined “Take Back Kentucky,” Wendy Caswell, the founder and President of the Louisville Tea Party, and a number of Kentucky Tea Party related groups in backing Bevin. 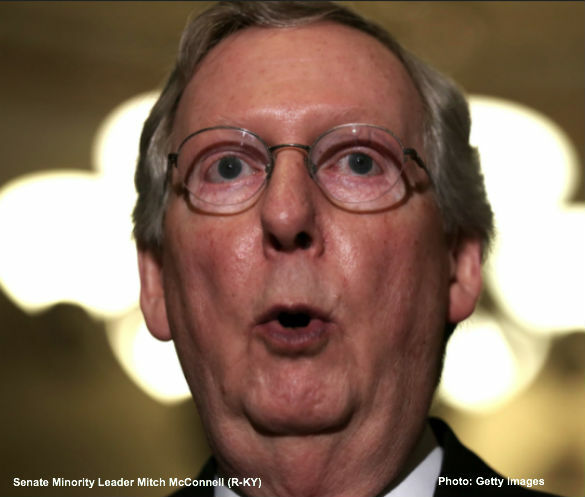 To paraphrase our friends at The Madison Project: If there is one individual who represents the face of the stale, tone-deaf, timid, moss-covered and obtuse leadership of the GOP establishment, it is Mitch McConnell. Mitch McConnell is emblematic of the rudderless leadership, vacuous core, and duplicitous tendencies of the powers that be within the Republican Party. Read Sarah Palin’s op-ed on ObamaCare and the Corrupt Bastards Club here. Submitted by rosugill on Tue, 10/22/2013 - 21:21. Mitch McConnell may well be the chairman of the Corrupt Bastards Club in DC and he is running for re election, but the people that are running against him are every bit as corrupt as he is and they aren't even in DC yet. So who do you vote for? I guess I'll vote for Mitch because he is probably as bad is he is going to get whereas the others haven't even started yet. Submitted by ONTIME on Tue, 10/22/2013 - 13:36. Submitted by al.78.1931 on Fri, 10/25/2013 - 16:10. Submitted by sukistjohn on Tue, 10/22/2013 - 20:35. It is way past time to save America with TERM LIMITS on these career idiots who are bringing us down while they line their pockets with $$$$$$$$$ and power. We can do this. If you agree go to www.termlimitsforamerica.com and sign the petition to get the job done NOW. Submitted by jfmatule on Tue, 10/22/2013 - 18:38. This dinosaur has been at the party way too long. He and Boehner need to go home and stay there. Mabey they can take McCain with them. The list of RINOS goes on and on. Go along to get along is their mantra. If it's possible we need to clean house and get some REAL conservatives on our team. Submitted by ONTIME on Tue, 10/22/2013 - 13:21.